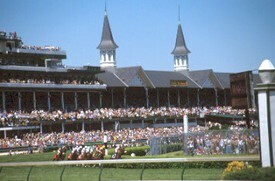 The Kentucky Derby, the icon of Thoroughbred horse racing, is coming on May 6th, 2006 and it is one of the great spectacles of modern sports. The pageantry of race is worth the trip once in your lifetime, not to mention the opportunity to see the greatest horse racing of the year. To help you with your travel plans, we included a few links to help you plan your trip. A famous trip to the Kentucky Derby is the Jane Dempsey’s Kentucky Derby Junket that has been going on since 1947 and captures the true spirit of the Derby. Sports Traveler also offers a tour with special seating for the race. The Blimp, a bastion of travel 70 years ago, may be making its way back in to our society as a cruise ship for the air. There are prototypes coming out (as seen above) that show the luxurious travel opportunities of slow flying across the country at low altitudes to see the countryside and travel in splendor. Very cool. This is not a Blimp. 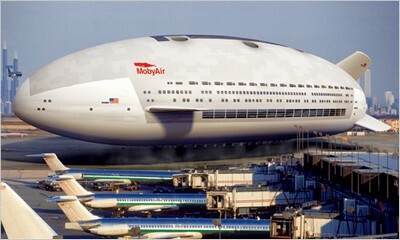 It’s a sort of flying Queen Mary 2 that could change the way you think about air travel. It’s the Aeroscraft, and when it’s completed, it will ferry pampered passengers across continents and oceans as they stroll leisurely about the one-acre cabin or relax in their well-appointed staterooms. Unlike its dirigible ancestors, the Aeroscraft is not lighter than air. Its 14 million cubic feet of helium hoist only two thirds of the craft’s weight. The rigid and surprisingly aerodynamic body—driven by huge rearward propellers—generates enough additional lift to keep the behemoth and its 400-ton payload aloft while cruising. During takeoff and landing, six turbofan jet engines push the ship up or ease its descent. When going on a cruise, there are many opportunities to experience the unique nature of the islands the cruise ship is taking you to, you have to remember that there are some risks. The cruise ship typically has no liability for you while you are off ship unless on an excursion that is sponsored by the ship. While a seasoned traveler will understand the risks associated of going outside the plan, many others who are not as savvy may expect to always fall under the cruise ships umbrella. Unfortunately when we travel we tend to relax and lower our guard. This may not be what you want to hear going on vacation, but the alternatives of not being prepared in a foreign country can be much worse. When cruise line passengers participate in onshore excursions like the one that killed 12 people in Chile, they need to take their own legal precautions and not rely on cruise ship company liability, experts said on Thursday. Passengers need to be particularly careful when they choose tours that aren’t affiliated with the cruise line, said Paul Ruden, senior vice president for the American Society of Travel Agents. 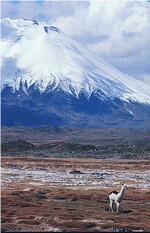 That appears to be the case in Chile, according to the cruise line. Ruden acknowledged some people choose local operators that don’t coordinate with cruise lines because they may offer cheaper tours. “If you’re comfortable being out on your own, that’s fine, but you’re taking the same risk of being out on your own that you would anywhere,” he said. Go! 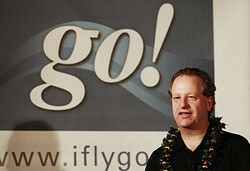 Airlines, the new subsidiary of Mesa Airlines, has entered the inter-island market in the Hawaiian islands. With Aloha and Hawaiian Airlines just out of bankruptcy, the marketplace looks like it has a battle on its hands. And with a introductory price of $39 one way, Go! wants to capture marketshare and pressure the already weak carriers. Phoenix-based Mesa Air Group Inc. said its new “go!” airlines will start flying between Honolulu and Lihue, Kahului, Hilo and Kailua-Kona on June 9. Mesa is one of the nation’s largest regional carriers with 182 jets, 5,000 employees and annual revenues of $1 billion. Flying to over 170 cities under the America West Express and other brand names, it is the largest company to enter Hawaii’s exclusive interisland market, dominated for decades by Hawaiian and Aloha airlines. “It is strategically the most important endeavor that we’ve embarked upon since I’ve been with the company,” said Jonathan Ornstein, Mesa’s president and chief executive. Hawaiian and Aloha both recently emerged from Chapter 11 reorganization and are responding quickly. The night before Mesa’s scheduled news conference in Honolulu, Aloha and Hawaiian announced they were selling a limited number of $39 seats through April 7 for travel June 9 through Sept. 30. That’s nearly half the usual lowest fares. via WTOP . See our previous post on Mesa entering Hawaii. The cruise story of the day is the horrible fire supposedly cause by a cigarette. The ship, the Star Princess, was quickly taken to Jamaica. 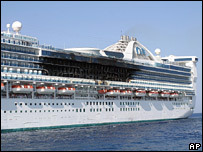 Damage was extensive and damaged 150 cabins on the Star Princess before the crew was able to put out the fire. The American died after suffering cardiac arrest, Princess spokeswoman Julie Benson said without releasing the victim’s name. Carnival Corporation stock took a tumble today, down 5 percent, after the news came out. It has been a difficult period for the cruise industry as low bookings, missing passengers, and other negative issues have been in the news recently. Delta Airlines in the face of a tough fight with its Pilot’s Union and working hard to emerge as a profitable company out of bankruptcy has worked hard revamping its schedule both internationally and domestically. They are planning on flying 1,000 flights a day out of Atlanta to 230 destinations around the world during the peak summer months and then ramping down the schedules the rest of the year. This is an increase of 30 destinations from last summer. Delta has identified 22 high-demand destinations where its summer schedule will be expanded during May and June. These include: Baltimore, Dallas Fort Worth, Indianapolis, Jacksonville, Los Angeles, Philadelphia and Seattle. “As we prepare for Delta’s busiest summer travel season ever, we are seeing increased demand for travel via Atlanta as more customers choose the convenience of flying through Delta’s largest hub to connect to nearly 230 worldwide destinations,” said Bob Cortelyou, vice president of network planning. “Delta will fly to more destinations this summer from Atlanta than any other previous year.” via CheapFlights.com . A tour bus carrying passengers from the Carnival Cruise Lines Millennium has crashed outside Santiago Chile leaving at least 11 people dead and many others injured . The bus was returning from visiting a National Park and was traveling on a poor section of road that ran along a cliffside. “We have confirmed 11 people killed,” Poli said. He said some of the dead were thought to be from the United States but did not have an exact number or identities. The crash occurred as the tourists returned to their Bahamas-registered Millennium cruise ship after visiting the nearby Lauca National Park. “We still do not know the causes of the accident, but the road in that was has several cliffs and is very curvy,” Poli told the Associated Press by telephone via Yahoo! News .